I've just released the first version of Béziers for iOS. It's a vector graphics editor specially designed for digitizing lettering projects on the iPhone or iPad. 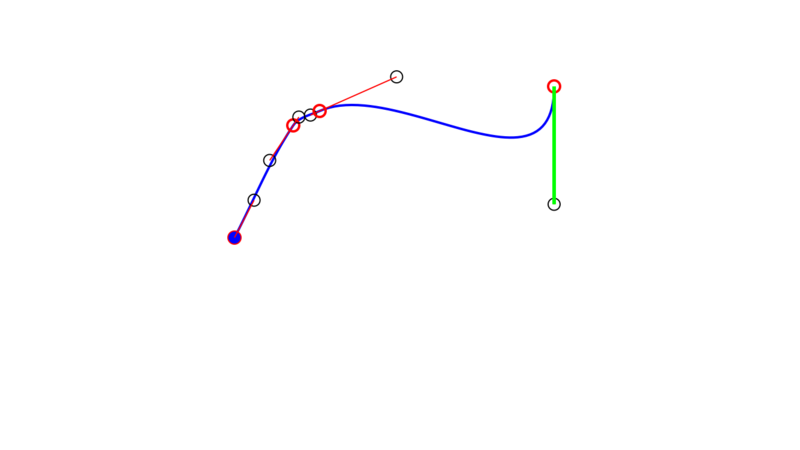 You can take a picture of your work, load it into Béziers, and start drawing curves. When you've finished, you can export it as an SVG file to load into your favourite desktop editor. 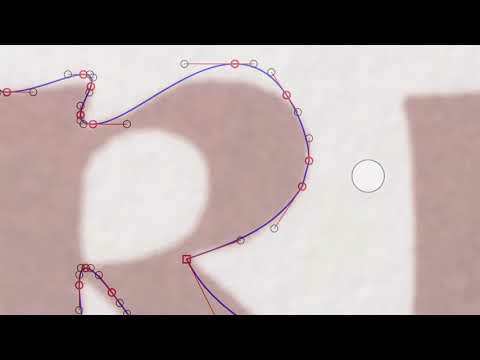 One thing I'm particularly proud of is that it performs edge detection on the picture as you're tracing and dragging nodes, so the tracing "snaps" to the edges of your lettering. It's really neat; you kind of have to experience it to get it. I've also added curve harmonization, balancing and all that sort of thing. You can get it from the App Store. This is my first commercial app release, so please be gentle. I'm happy to work through any queries or problems. Neat! And congrats. I'll try it out. I haven't spent much time with it yet, but I was a bit confused by the UI, which at first seems to only let you draw and adjust paths. The intro video started before I realized I should be paying attention, so I missed some of the getting started instructions and couldn't see any way to rewatch it. After a bit, I figured out how the UI works. For anyone who wants to try it, all the commands (add bg image, export, etc.) are in a pop-up menu which is displayed when you do a long press. Creating a new document is via the "files" command. Simon, if you can figure out a way to do it, I would suggest you use a two-finger tap for undo, three-finger tap for redo, like ProCreate. :-) In fact, ProCreate has lots of great ideas for making an easy to use touch-based graphics app UI. Is there a way to add a node to a path (other than extrema)? Sure, double tap on the path. That deletes the off-curve points, changing a curve segment into a straight segment. Huh. The idea is, if you’re close to a node, double tapping will delete the node; if you’re closer to a path than to a node, double tapping will add a node to the path. I may need to adjust the sensitivity of that operation, but in the mean time, try zooming in and making sure you’re hitting the path. Weird. Now it’s working using the Pencil. A minute ago it wasn’t. Hmm. Definitely does it sometimes. Not sure how to consistently reproduce it. Seems like maybe it happens when the ends of handles are close to where you’re double tapping. Right. It has to make a decision on if you’re tapping near a node or near the path, because you’ll never hit the node’s location exactly dead on. If the two are close it may well make the wrong choice. Zooming in will help but I may need to adjust the distance computation - I think it might favour nodes if they’re close rather than paths. I will put this on the list for the next release. John Hudson has already requested a “tap nudge” feature which I’ve added, and I’ve found a bug in the Add Extremes code, so I’m hoping for another release next week. I would love to test it with a Pencil, but sadly don’t have anything that will support it. There doesn’t seem to be a way to open an existing document, i.e., one that was started in the app. I started a document, and then did the “files” command from pop up, just to see what it did. It let me browse files, but there was no way to cancel and get back to resume working. The only action that seems possible is creating a new document (the + icon). I can see the file I was working on the the Beziers folder in Files, but I can’t open it to resume working on it. If I try, it just takes me to the file browser in Beziers where the only action is to create a new document. The Beziers documents are all grayed out. Also: On an iPad, in landscape orientation with charge port to the right, it runs upside down. It only works right side up in one of the two landscape orientations. It doesn’t rotate with the iPad. That one’s an easy fix. I haven’t come across the file browser problem; I will look into it and see if I can reproduce. I'd like to suggest "HV nodes" which snap to 0/90 degrees, which is especially useful for extremas.